For years franchise lenders have used SBA failure rate data as an initial screening tool to determine whether they should consider a loan to a prospective or existing franchisee. Many lenders have inserted failure rate limits into their credit policy guidelines. They do so even with the clear SBA disclosure accompanying these data that SBA failure and loss information should not be relied upon for credit decisions because of data quality issues. In most of the brands we have evaluated, SBA data overstate, sometimes by multiples, actual loss unit experience in those brands. The result is that most brands are adversely affected when it comes to capital access. And that needs to stop. In franchising, lending decisions are made easier if the lender can look at the performance history of the franchise system. Since all the units in a particular system are basically the same, if all the previous units were successful, then a lender can safely assume the unit they are about to finance will be successful if the borrower meets standard bank requirements. The credit decision can focus on the borrower's individual qualifications. With such good performance data about a brand, a lender can adjust borrower qualifications. Thus, in the credit risk world, franchising has a distinct information advantage. Franchise systems have performance data to show what their credit risk profile is. If a brand has very few failed units, lenders not only will offer more capital, but do so on more favorable terms. The question lenders must confront is what data to rely on to determine the credit risk profile. From our credit analysis work, they clearly shouldn't rely on SBA data. Even if SBA performance information were accurate, it still wouldn't reflect the right measure. SBA failure is a technical definition, not a performance outcome. While some loans get reworked and others are written off, neither of these actions reflect what happened to the unit or units related to a particular loan. Yet from a lending standpoint, the performance of the underlying unit is the essential measure of a franchise system's predicted performance. SBA data simply are the wrong basis with which to assess a risk profile. 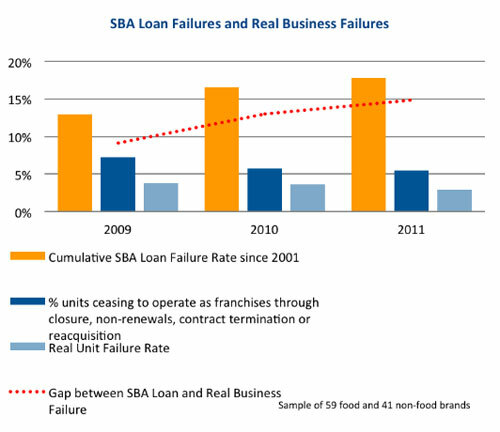 To show how big an opportunity the franchise and lending communities are missing, we compared the official SBA failure rates to FRANdata's discontinuity rate (a unit no longer in the same location from one year to the next) and true failure rate (by the franchisor's internal information, a unit that failed for operational or financial reasons and no longer exists) for 100 franchise brands, 59 food and 41 non-food. The results are dramatic. Not only are the absolute levels of measured risk different by a magnitude of three to five, but the trends are different as well. Which one reflects the best way for a lender to make a decision about the likelihood a given loan in a particular franchise system will be paid back? One has to be better than the other, but which? To be clear, the SBA and FRANdata data sets look at slightly different measures and use different time periods. (As we develop a deeper database of risk information, we are expanding the time period analysis in Bank Credit Reports.) FRANdata measures unit outcomes, not franchisee borrower outcomes. In addition to units that disappear for operational or financial performance reasons (real failed units), units can simply move to another address or come to the end of a renewal period. Outcomes like these make up the difference between discontinuous and failed units. All such data come directly from franchisors (they're not found in FDDs). Clearly, unit outcomes are a more complete picture of how a brand is performing and no doubt represent some of the differences in the graph. The SBA not capturing all the performing loans made to a particular brand distorts brand performance in the graph. However, even accounting for these differences doesn't distract from the fundamental point: lenders today have a better risk assessment model for franchise loans reflected in the type of analysis done in Bank Credit Reports. Much better. Banks are catching on to this vastly improved way of assessing franchise lending risk. As banks push more brands to be underwritten to this improved set of credit standards, a deeper database of comparative data will evolve. As it does, more capital will flow to franchising because of the greater understanding of the risks involved. As all successful bankers know, if you can understand the risks, you can structure and price a loan to reflect that risk. 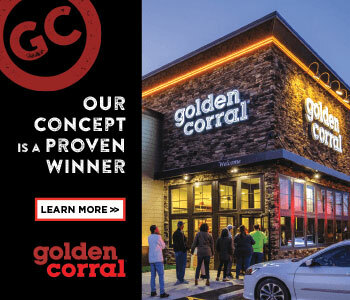 In this new era of lending, franchising has a competitive advantage.